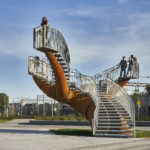 Dendrites is composed of two huge staircases sculptures. 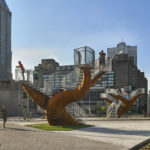 Placed on either side of Rue Notre-Dame and integrated at the north threshold of the Bonaventure project, the hybrid-shaped sculptures emerge from the ground like two great industrial-looking trees. Similar in morphology, these structures stand out for their size and twisting shapes. 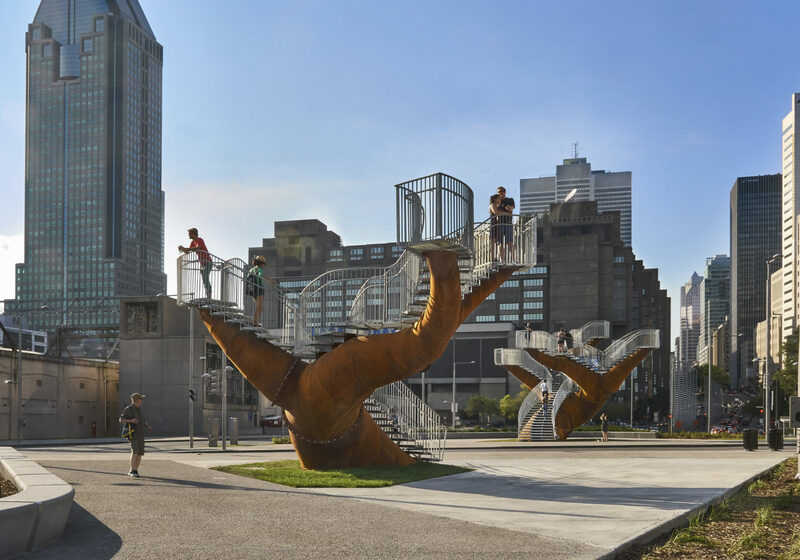 The weathering steel used as the main material refers to the manufacturing past of the district where the work is installed. The ochre colour of the oxidized surfaces bears a resemblance to tree trunks. The term “dendrite” refers to the branched extensions of neurons, which propagate cerebral stimulations from the brain. It also means a ramification, a tree-like grouping of branchings of a network or system. The two elements that form the work reproduce this neuronal phenomenon on the scale of the landscape. The branches that spread parallel to the ground take the form of staircases that visitors can take to reach the ends of the ramifications. Whether visitors view it from the ground or climb its staircases, the work plays on effects of scale. On either side of the street, the two elements face each other, communicate with each other, giving the impression that they are connected in the middle of this vehicular and pedestrian intersection.